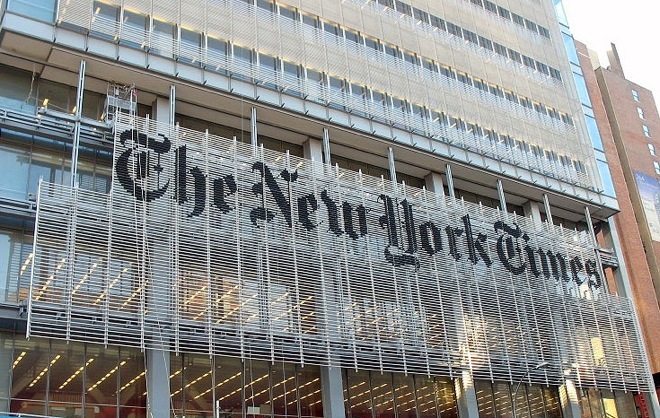 Nobody – not even the New York Times is safe from the digital revolution. That’s the message of Page One: Inside the New York Times , a docu-film -showing at the IFI this week, which follows editors and writers at the publication as they respond to falling revenue, new media outlets and the speed of social networking. Most of the scenes come from inside the NYT Headquarters and feature an array of high-strung, high-functioning individuals in front of multiple computer screens, yelling down the phone, exchanging smart comments and looking like they’re about to boil over as individually they compete for space in the publication and collectively fight for their survival. 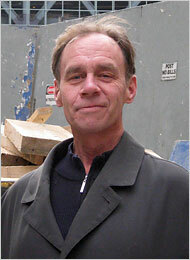 Footage is taken from between 2008 and 2010 and while there’s no obvious narrative structure, we’re gradually introduced to key figures, like David Carr, staff writer, former crack addict and in-house character. We get a glimpse of the dilemma facing the publication as wikileaks arrives onto the scene and bewilders the world by posting videos of disturbing war scenes on youtube. We get the first reactions (what’s wikileaks?) to the final question over whether collaborating with the Guardian and Der Spiegel to release wikileaks’ wires renders Assange a source or an associate. Comparisons are made between The Watergate scandal, which broke over the course of a year and a half’s reporting – primarily by Bob Woodward and Carl Bernstein of The Washington Post- and Assagne’s overnight release of a vast quantity of sensitive material for pubic perusal. We get the sense that the source of power is changing: where Woodward and Bernstein relied on the Washington Post to distribute their findings, now The New York Times depends in part on Assange’s willingness to use it as his outlet. Page One documents the complexity of the relationship between The New York Times and Assange. Granted it’s symbiotic but in comparison to the media landscape of the 1970s a disproportionate amount of power lies with the source. Assagne benefits from the relationship because his material becomes associated with a credible source but The New York Times faces the uneasy task of ‘keeping up’ with a story that’s developing faster than it can be be digested. Furthermore, we can see how The New York Times is taking a risk with Assange: how can they substantiate a source that describes himself as espousing the “values of activism” over those associated with journalism. What does that even mean? Page One asks the questions it cannot answer. How can print media sustain itself? How is the role of journalists changing? Newspapers didn’t predict that advertising revenue would disappear with the rise of the internet. They weren’t ready for the arrival of websites that featured classifieds and for the advent of faster, flashier, funkier outlets like gawker.com. Things changed fundamentally in about 18 months, an insider tells the camera. In the course of filming, 100 odd people are let go. The deputy obit editor has been there for over 20 years and takes voluntary leave. The Books and Arts editor seems on the way out too. We watch a teary few words from somebody leaving. Gathered about her are her colleagues applauding numbly. We get a shot of the enormous multi-storeyed newsroom and the tiny cluster of people gathered about the retiring journalist. It’s an image of resilience but the journalists appear tiny amongst their overwhelming surroundings. The newsroom atmosphere has always been one of high-tension but in Page One we really get a sense of individuals constantly on the verge of boiling over. They’re always nibbling, always minimising windows on their computer screens while firing questions down the phone and gesturing to their colleagues to get things done. Where they excel though is in their attention to getting it right: there’s constant debate over what should go in and at two daily meetings, editors must justify their content. They’re still all about reporting from the ground, and there’s a sober clip of a goodbye party for a young correspondent being sent to Iraq. As the credits roll we find out that he has become chief Bagdhad correspondent. Page One does a good job of documenting the uncertainty that surrounds The New York Times, along with all other print media. Unconsciously it documents what might be its saving grace – attention to detail, passion, unbrdidled dedication to getting it right and the conviction that a journalist’s place is first on the ground, and then on twitter. Page One – Inside the New York Times is showing twice daily in the IFI until Friday 29 September. Every weekday morning, I brush my teeth while listening to the business news on Morning Ireland. Once the weather comes on, I know it’s time to spit. The presenter’s mame is Emma. She sounds very glamourous and by jove, does she know her business. She’s all about credit ratings, bondholders, soveriegn debt and the EU-IMF bailout. In fact, these are some of her favourite things. She interviews chief-executives, London traders and business-market leaders at break-neck speed, firing at them an alarming assortment of questions which I don’t comprehend. I’m not a scientist or anything, but I think there might be a critical period for developing business accumen. At school, while other students were learning about the stock exchange and interest rates, I was declining Latin nouns and checking out cartoons of Roman boys in togas. As a result, I simply don’t get economics. When I see images on TV of old men in high-rise glass buildings pouring over computer screens at changing numbers and getting very excited, I just think “huh?”. When people talk about “burning the bondholders” I get a mental image of Shakespeare’s Shylock being burnt at the stake. I’m absolutely baffled that a body with as temperamental a title as Moodys can dictate at a whim the direction of markets values. As regular readers will know, I’ve some desire to make it in the world of journalism. Back in the day I thought this might involve composing a few witticisms on farcical political characters, or being sent to cover a dull Dáíl debate on fishing quotas. Now, to my horror I’ve discovered that the whole world functions on principles I do not understand. In an attempt to salvage my career prospects, I looked for measures to reduce my deficit. Oh, how I googled. Oh, how I typed search terms like “bond holders”,and “bailouts” into Wikipedia. Alas, it was like a never-ending economic web, with each explanation containing a further collection of incomprehensible fiscal terms, which in their turn had to be googled. But then everything changed. I was walking past Trinity last week when something caught my eye. Perched on the top of a lamppost, like a beaming Evangelist was my answer: a poster with the title “Understanding the Euro Crisis”: an invitation to a public meeting on the subject: All Welcome. It was like a sign from the heavens. 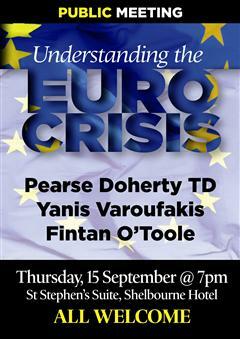 The speakers advertised included Pearse Doherty and Fintan O’Toole. I was sure they wouldn’t let me down. After all, they’re all about bringing it back to the people. As I left the house last Thursday night I called back “just off to a Sinn Féin meeting. Might be late..” before slamming the door. 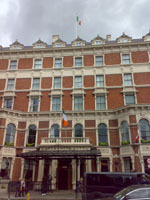 There was a spring in my step as I got off the luas and made my way to The Shelbourne. I had brought my notebook with me so that I could jot down key economic terms with which to regale my friends in the future. I felt like a proper journalist. Outside the Shelbourne, a group of middle-aged Americans was getting ready for an expensive meal in the city. I know this because the ladies were dressed in exquisite skirts with lace trimmings and because the mean were smoking cigars. And because they were outside the Shelbourne. I approached the doorman who was guarding the rotating glass entrance door. “Good evening, Madam” he said with a gallant Polish accent. I gulped. It could not be. “Oh what a shame!” I replied, downcast, imploringly. I beamed. What a sterling human being he was. I became alarmed. After some time I returned to my Polish friend and asked him what my prospects were. He must have sensed my economic passion. He sighed “You may go in Madam. Turn left at the pillar and enquire there whether you may enter the meeting”. I almost stumbled in my excitement and as a result briefly got stuck in the rotating door. Once in however I rushed to the attendant by the pillar. “Excuse me, I was wondering whether there might be space for me in the meeting? What. With those three words my heart sank. My bubble burst, I turned away dejected and slumped out the rotating doors, past the doorman and back to the luas stop. €3.50 for a return luas fare only to be turned away at the door! What an absolute waste. Needless expenditure. That’s exactly what got us into the mess we’re in. What are the atrocities of our time? Every period of history spits out its horror stories in retrospect: the murder of six million Jews, the abuse of children at the hands of priests and the institutionalisation of political dissenters. We’ve got used to documentaries exposing the trauma of war, neglect and corruption. We expect them like we do the next episode of a soap. It’s a sign of progress of course – though it makes me think about the abuses of today that will make it into the documentaries of tomorrow. Today it was revealed that a criminal gang in Bedfordshire has been operating a twenty-four men slave work camp at a caravan park. According to British media reports, victims were lured from soup kitchens, benefit offices and hostels. Nine of them (presumably those of slightly higher standing or those suffering from Stockholm Syndrome) have refused to co-operate with police investigations. According to the Guardian, one traveller said that “Plenty of men who were here wanted to be here and they were getting paid”. As if the volition of plenty justified the slavery of a single other. Last week the abuses of Iraqi prisoners by British army officials was relived in grotesque detail with the publication of the full report. Tonight the second part of the RTE investigation into the practices going on behind closed doors in state mental institutions was broadcast. I work in a not-very-nice area of town. Sometimes I see the faces of future documentaries gazing blankly past me, as they cower terrified at the knees of abusive parents, or bend their weary, wizened faces over pint glasses at 8 am, when the early license pubs are ready for their next order. Last week I watched two families staggering about on the luas platform. Dirty beer cans in hand, the parents drunk and drugged, yelled at each other as they stumbled against empty buggies from which their toddlers wandered aimlessly away. One little boy with huge brown eyes looked at me and I stared back at him, knowing my inevitable complicity was failing him. The luas doors opened and his parents endeavoured, with clumsy futility to secrete their multiple beer cans at the bottom of their buggy. The injustice of bad parenting – and the audacity to pass judgement on the nuclear family unit – this I believe is the stuff of next generation’s documentaries. What else, from where you’re standing? When I was young, I learnt to play the violin at the College of Music in Chatham Row, just around the corner from Stephen’s Green. In my later years, it was renamed “The Conservatory” but the Fergusons – staunch Conservatives – continue to refer to it simply as “the College”. My teacher, a middle-aged eastern European was quirky and sober in equal measure. He was so confident of his methods that he invited parents in to observe his lessons. Most declined politely: but my mama certainly didn’t. So great was her love for me that every Thursday afternoon for years she endured the hostile scratching of my bow as it glided gracelessly across the four strings to produce sounds that can only be imagined -and excused- when I explain the meaing of: intonation exercises. Unfortunately the noble purpose of intonation exercises is disguised by their horrendous sound. You see, the thing is: to play violin, you need a pretty good ear. It’s not like piano, where you just bang on a given key to produce a sound. With violin – as with all stringed instruments – you have to find the sound. And in order to do this, you need to be familiar to the very last quarter tone, of the location of each sound on the finger board. Intonation exercises consist of playing two given notes at once and then slowly, repeadly changing the position of one of your fingers by roughly half a tone up and down to produce a clash which resonates and aims to cement in memory the correct position of your hand. To really make them useful, you have to repeat them over and over and over again…. This level of endurance represents just one of the ways in which my mama is a hero. I could write a pamphlet on her other feats. She deserves at least a series of blogs in her honour. The best part of Thursdays was right after the violin lesson ended. Mum and I would hurry out into the wind and rain and make ourselves to the newsagent on Camden Street where we treated ourselves to a packet of Sour Cream Hunky Dorey’s each. We kept them in our coat pockets so that we could have a look around the various charity clothes shops on the way home. Sometimes, when mum was looking at blouses in Age Action, I would sneak a crisp or two from her coat pocket, just to be devious. When we got home, we would have dinner and then get ready for Kommissar Rex. If you know me, you know all about Kommissar Rex. If you don’t you should get informed. Kommissar Rex is a TV series about a detective and his police dog “Rex”, who sleuth around Vienna solving crimes in scenic locations. I’m an enormous fan and the actor that played the detective in my day remains my only celebrity crush. LSB doesn’t like the twinkle that appears in my eye when I talk about Gedeon Burkhard, or indeed the way, when I spotted him playing a minor role in Inglorious Basterds, I nigh jumped from my seat with excitement. Kommissar Rex is moderately scary and featured a rather disturbing scene of a man trapped in an over-heated sauna which I have never forgotten. When LSB and I were in Vienna, I finally bought the series on dvd. One night, having stocked up on Croatian beer and strawberry cake, we knocked on some Kommissar. I was right back home again, curled up beside my mama, reaping the reward of intonation exercises.